Two months ago I shared a blog post about my valuable learnings as a new Airbnb Superhost. 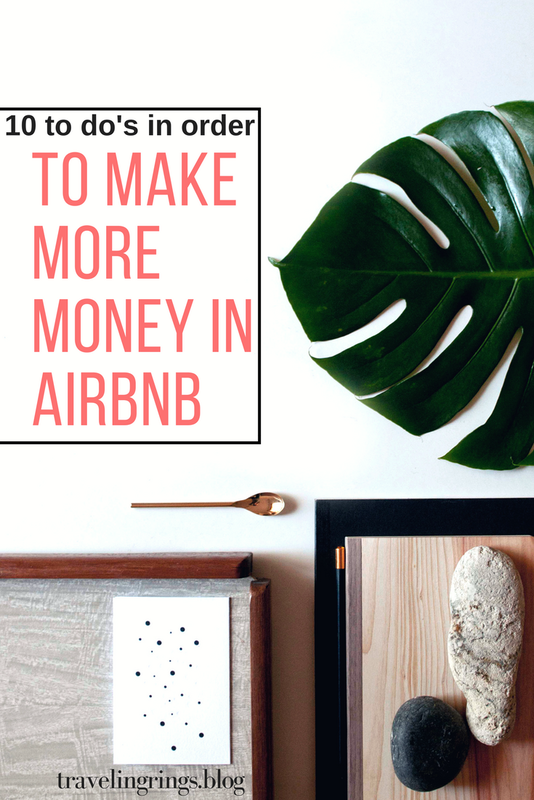 Today, I would like to share in this post some of the things I believe Airbnb Hosts must do in order to increase their profit in hosting. Again, I’m not an expert and I consider myself as a newbie in this industry but I believe if these things worked for me in my journey maybe it will to you too (even just a little) . So here you go! As much as I don’t want to do this part, I need to do it. I need to sit down every 1-2 months and check my income and check my expenses. I only use excel for this. Simple mathematics. I record all my income and expenses and see how much profit (or loss) do I have in a particular month. As you do this you will realise things what you cannot afford to give to your guest or until what percentage you want to give in your discounts. What kind of toiletries I can provide and how much are they? And the list go on. It’s amazing how much insight you can get by just checking your monthly in and out. You can also decide how much is the best nightly rate for you as you do this accounting more often. I believe this is crucial part in making sure we are making the most money in our Hosting journey. 2. Communicate to your guests and really be interested in their lives. Communication is a big factor to be successful in Airbnb hosting. I think the difference between us and the hotels is this one. We make it more personal and with more human connection. Through this hopefully we make their stay more memorable and special. What I usually do is to communicate with them even after check out and after they have given their review. Especially if they rate lower than 5 star, I do make an effort to find out what is it about and what are they really thinking. By doing this, I have opportunity to improve for other guests but at the same time they can become a potential guest that will come back one day. Make them feel you are real and present and listening to them. One time, my mom went out to eat dinner with our guests and ended up touring our guest around . It’s a very good experience as we become friends with this couple until now. 3. Let your Listing stand out. Whether it’s interior deco or awesome freebies, or whatever you think will make your listing stand out just do it! Complete appliances and kitchen utensils . Business ready – this means your listing has fire and carbon monoxide alarm, wifi, hair dryer, and computer/study table available. This will make your potential guests (who are travelling for business) want to book your listing. 4. Let the Superhost badge be your goal. Though I believe that this should not define you as a host, Airbnb put this in order for hosts out there to excel. If in the end of the day you didn’t meet the criteria of being Superhost, it is fine because at least you put effort in being better as a host. It means the better you are as a host and the more great reviews that may results to more bookings. Use this to motivate you to excel and not to make you feel pressured in any way. 5. Do not give what you cannot afford. Though it’s good to give a wine (for example) as a welcome gift, you need to consider your finances. If your listing is only 25$ per night, I don’t think it is worth it. Think of something you can afford and something that won’t hurt your pocket but at the same time still be that hospitable host that you wanted to be. Apples / Bananas or any in season fruits. Local product that is affordable. Maybe a local coffee? Or local biscuit? Be creative and think of something that your guest will appreciate. I know right?? Sometimes Airbnb can be very irritating! They keep on sending you reminders that nudge you to review that guest who just check out or say hi to that guest who just check in. But thinking about it, its actually a helpful way to be an on-top host! Airbnb is awesome thank you!! Thank you for reminding me all these little things that I can easily forget. Especially if you start hosting more than one property.I have a full time job and a young mother to a two year old girl so its difficult for me to remember everything. I use these Airbnb reminders for me to keep in touch with my guests and it usually turns out plus point for my side. There’s a guest recently who brought out some of his concerns because I messaged him and asked him how’s everything in the house. This gave me a chance to help him with his concerns. And of course all this conversation happened because of Airbnb reminders to send my guest a message. Use Social media for our business! I have 1000 views (average) per property now every 30 days. I can’t believe at first but that’s a lot for me! 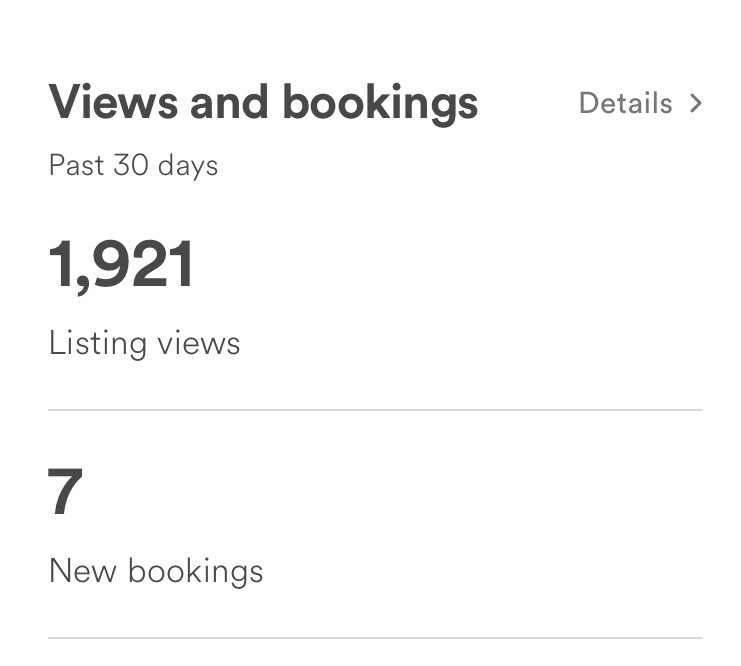 I only have 400-500 views per month per property when I’m not yet advertising my Airbnbs and it went double when I did advertise! It worked for me So I highly recommend this. Copy a link from your listing and send it to your friends or post it in your personal Facebook and Facebook groups. Ask them to put in their wishlist. This will increase your views and increase a chance of people booking your place. And to be honest, one of the reasons I write blogs about my Airbnb journey so in a way this can help advertise my listing too. Thats why you are reading this now! Pssst… thats our secret but please do visit my listing ok? Thanks! 8. Ask your guest to give you good review. This is very important to me. Right after they check out, I send a message thanking them and humbly asking them to give me an awesome review (only if they have positive experience) and asking them to put their feedback in private message. This usually works as they will put effort once I ask. If we don’t tell them how important the ratings are, they will not take it seriously. Often guest are helpful enough to leave a great reviews! 9. Compensate or simply offer a discount to encourage guest to come back. This is very helpful especially if your guest is not happy with something in their stay. Compensate them for their inconveniences. They will appreciate this and will feel that you truly care about their experience. As a superhost, I take it personally when my guest didn’t have a great experience. They book my place expecting a great time so I want to make sure they will have one keeping in mind that everything don’t always go the way I wanted it to be. When it comes to offering a discount, this is more a natural response for me than a sales tactic. When a guest is checking out and I felt grateful for that guest for choosing my listing and for being a great guest, I usually ask them to come back and offer a discount if they will come back the second round. If you become friends to your guest throughout their stay, this makes more sense. If you gain their trust and they are satisfied with your service, they will likely comes back too. How much more if you offer a little discount. Surprise your guest with something that is not written in your listing. For example, putting a fruit basket or a fresh juice upon check in, or extra fluffy slippers waiting for them upon check in. Anything that would make them feel that you are giving them extra service and they didn’t pay for it. It will contribute to a more satisfying stay. Next postHow to increase your bookings in Airbnb? This is an informative post. It will come in handy if I ever host in airing infuture. I like what you wrote. This is really a good piece of info. Gonna share this with my colleagues. Interesting! I’ve thought about getting into AirBnB since my husband and I travel a lot. I’ve always found the whole thing kind of intimidating. These tips seem doable and practical. Any tips on getting started? All those little details really and finishing touches really make a difference. I love the welcome gift with fruit. Great Idea! I love hosts who go the extra mile to be more accommodating! Airbnb is such a great platform to travel the world within your budget. Thank you for sharing. I think details are always important, especially in a competitive market, personal attention. Good pictures are always what I am looking for when I look to book rooms. Thank you for sharing your experience! Airbnb is a good platform for traveler. I always use it too. Nice! I have only stay at airbnb but never rent one. This is interesting, thanks for sharing!